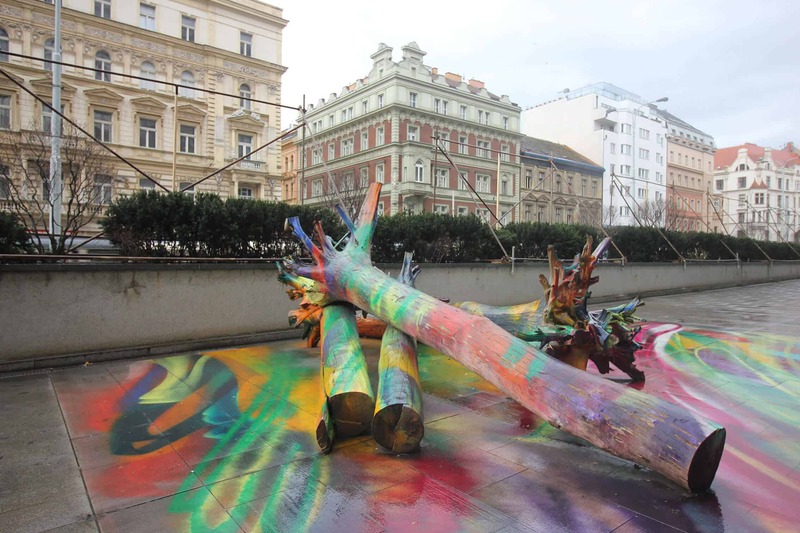 An exhibition of works by the Berlin artist Katharina Grosse is now being held in a the Czech National Gallery in Prague. Playing with color, light, and human fantasy – all of which is analyzed and explained by Nina Johnson. Upon entering the Great Hall of the Trade Fair Palace, you will perceive yourself as having enteredan artist’s studio in which an explosion of hundreds of multi-colored paints has occurred — but a controlled explosion. On both sides of the huge room, separated from the street only by a glass roof, huge canvas panels seem to tumble down. With the help of stencils and spray guns, many layers of acrylic paint have been applied to them. The first impression is of colorful chaos, somehow annoying to eyes of a city dweller who is accustomed to the calm palette of Prague’s exteriors. However, after looking more closely, you begin to understand that this tropical storm – so much saturated green here and there! – has broken out under the guidance of amaster. The paint, though abundantly applied, leaves space for “drawing” – the ends of the heavy cloths that lie on the ground, like velvet draperies in a theater, are left blank. In some places, colored contours form clear geometric figures. In some places, on the contrary, you can see the outlines of leaves, clouds, and objects. The images that come to mind vary with the angle of view. The correct way to perceive a work that literally does not fit into any frame or frameworkis to stay alone with it for a while. Do not be deceived by the seeming simplicity of the idea, but let the colors absorb you, observe that the color thickens, draws you into its waves and adjusts you to its vibrations. As Gilda Williams writes in her book «How to Write about Contemporary Art», an understanding of one or another object of art is transformed and developed in the process of contemplation by the viewer. 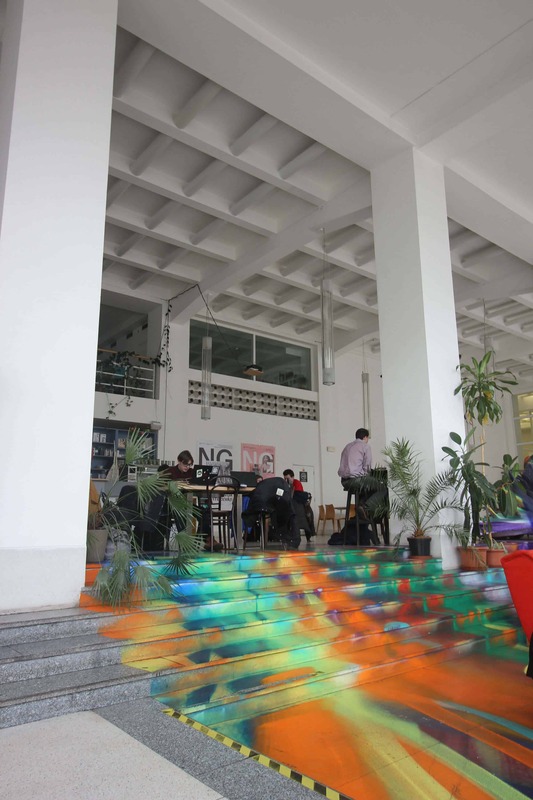 The colorful curtains which seem to transform the stern architecture of this space were created specifically for us by the German artist Katharina Grosse, notes the exhibition curator, Adam Budak. Back in the ‘20s and ‘30s, this used to be the place where the achievements of creative human minds and advances in technology were on view, like big tractors, zeppelins, and so on. It was a place for exhibiting, not art, but the achievements and the technological progress of that time. This place was called the cathedral of modern industry. For the second year now we’ve been using this space for size-specific projects, so we ask artists to develop an idea for this monumental interior. We look for artists who we think would be able to cope with this scale, with this volume, with this size. In 2017, the Great Hall space was occupied by aproject of the Chinese architect and civil activist Aj Wej-Wej called “Law of the Journey”. In 2018, it was replaced by Katharina Grosse’s “Wunderbild” project. Katarina Grosse was the right choice for this kind of challenge, because she has worked before as a painter who works outside the box. So this is important and also that she has not only a regular studio practice, but also an outdoor practice. She is interested in canvas that is framed, because she was trained as a painter, but she has always had this desire to go literally outside of the gallery space or outside of whatever interior where the paintings have been shown. 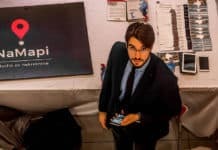 Despite the fact that the canvas is formally located inside a building, we can assume that it is separated from the outside world by a very thin border. The grey walls and dvorana floor resemble concrete and asphalt streets, while the roof features a glass ceiling, which lets through not only sunlight, but also sounds – birds chirping, weather sounds. Moreover, there is a soundtrack, created specifically by Katharina’s friend Stefan Schneider. He composed sound which is electronic, so it’s industrial, but this sound is programmed in a some what uncontrolled way. We can spend hours here and we might not be lucky enough to hear it, but sometimes there is the right moment and the sound appears for maybe 3 minutes or something like that. You might not even notice it, because you don’t expect it. The Katharina project is able to be transformed not only through sound, but also through changes in the seasons. It has been beautiful this summer. As you know, we had a very hot summer, we had a lot of sunshine, so the sunshine penetrated this space and created incredible shadows. The shadows reflected the geometry of the architecture, so there was another layer on those canvases. 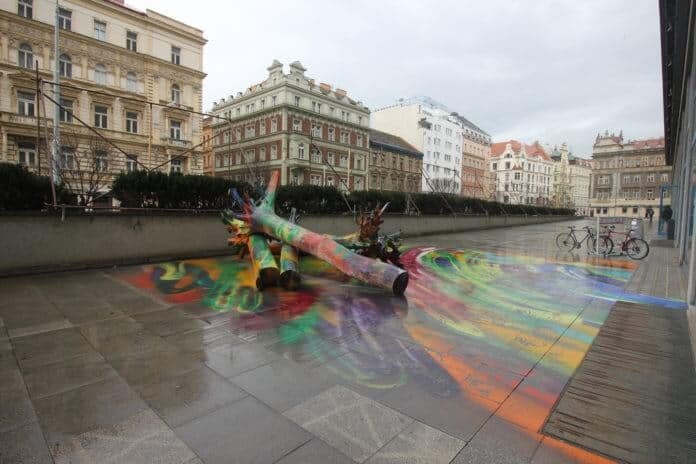 However, Katharina extended some of her paint onto the street: in the cafe on the first floor and directly in front of it, at the entrance, huge trunks of old trees were piled on top of each other, which would look ugly if they had not been doused with a rainbow of acrylic paint. 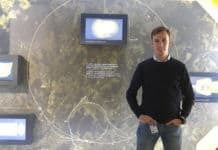 According to the exhibition curator, both parts of the installation are especially attractive to the younger generation. Outside is a section made of trees, which serves as an excellent playground for games, and inside is a real,color version of Lewis Carroll’s Wonderland. That is understandable, because Katharina, in the process of creating “Wunderbild”, appealed for inspiration not only to the frescoes of Giotto and Matisse (she loves stencils and patterns,as they both did), but also to her childhood memories. At the beginning of exhibition catalogue, I quote Katarina Grosse,who says that when she was young, before she woke up and got out of her bed, she looked at the ceiling and imagined the brushwork that would be necessary to remove the shadows from the ceiling and from the walls. That was the moment when she realized that she wanted to do something art-related, and that art should change the world – an ambition that continues to influence who she will bein the future and what she is going to do for our world. Perhaps the artist guessed correctly the most appropriate means for her to change the world. Even in the mysterious traditions of ancient Egypt and Greece, color therapy occupied a significant place. Although it is impossible to predict what effect Grosse-therapy will have on this or that visitor, you want to think that it will definitely be positive. After all, the process of Katharina’s work in creating Wunderbild can be described as a kind of deep meditation. She started painting on the floor, likea writer who obtains a blank paper before he actually starts writing. She started to spray, because the spray gun is her brush. She does it in her costume, looking very futuristic, applying acrylic paint on the canvas working alongside her assistants. She also uses stencils, so she puts another layer on canvas, and sprays on it, and removes it, and repeats. It’s aprocess that develops over time. The result is a picture that is flat, but it is actually thick, she says that it is the residue of re–thinking. But it also has density. We don’t know how many layers there are,and I don’t know if she knows. It’s an uncontrolled process. She stops when she feels like it’s enough. She says that she is particularly interested in thealmost spiritual moment when the image appears. It’s an enigmatic moment, you never know when it happens or when the image is finally there. That’s what excites her and I guess viewers,too. 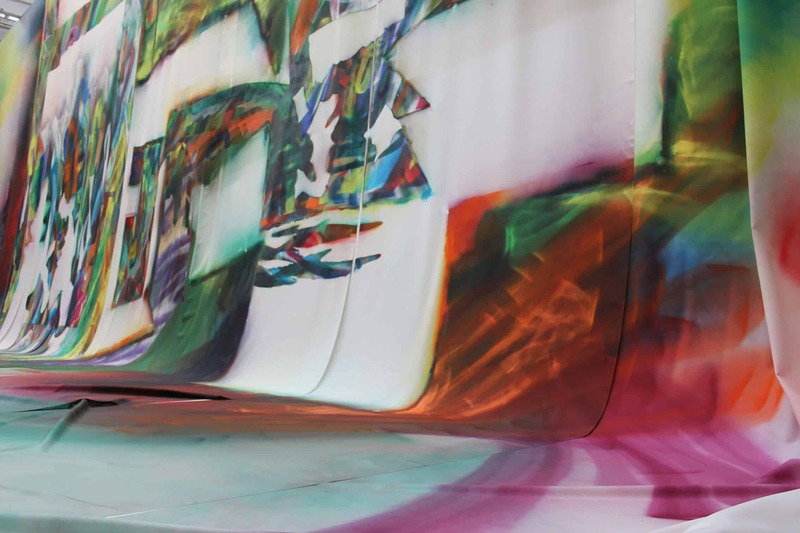 It is so adorable that it is even scary sometimes – according to Adam Budak, discussing the work of Katharina Grosse, it is worth remembering the philosophical term of the XIX century – sublime. Sublime was sort of the contra-point to beauty. You love it, because it’s such an outstanding phenomenon of nature, but at the same time it’s dangerous,like mountains or waterfalls. It’s so powerful, you feel this fear of conquering it. To jerk and jump out of the framework of ordinary life. To see the brightness of the world and admire this act, although it is scary. Perhaps this is the thought that pulses through the brain after a long session of Grosse-therapy. 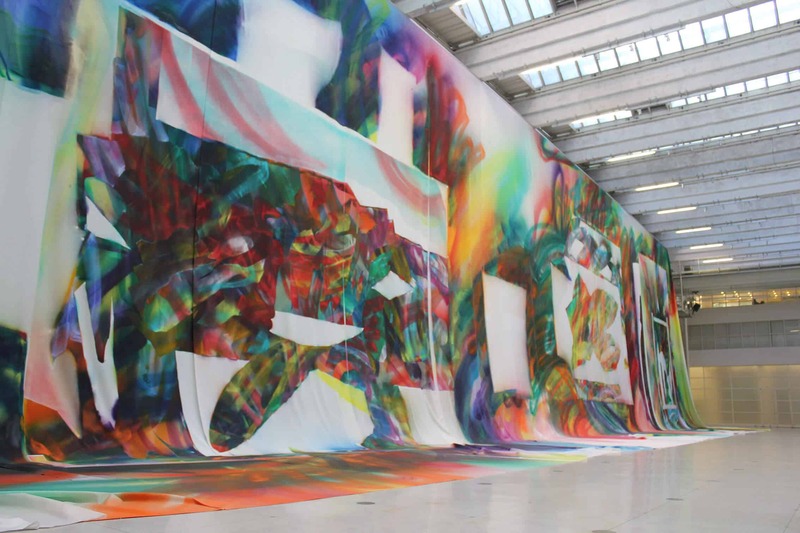 Katharina Grosse was born in 1961 in Freiburg, Germany, and now lives and works in Berlin. She studied at the Kunstakademie in Düsseldorf, Germany, and at the Kunstakademie in Münster, Germany. Since the late 1990s, Grosse has worked almost exclusively with industrial spray guns in lieu of brushes, applying vibrant fields of atomized acrylic to virtually any available surface. 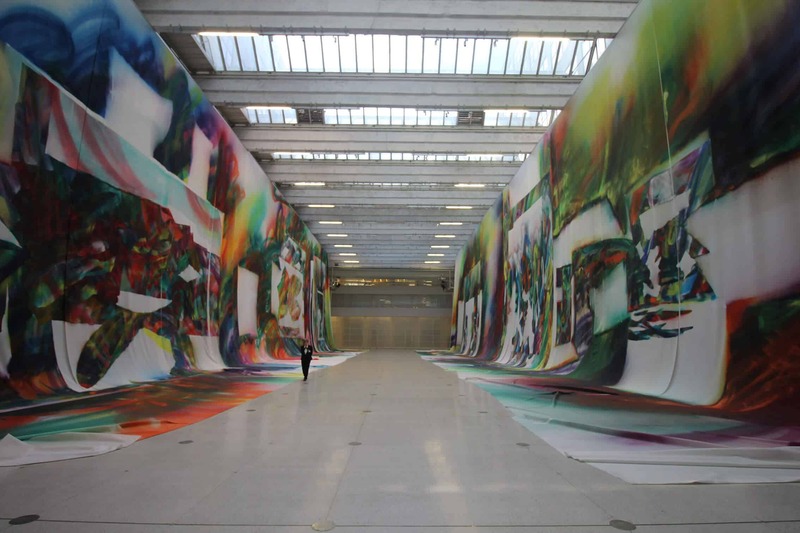 “Wunderbild”is the first work Katharina Grosse has made on such an impressive scale. For the first time she “went beyond the framework” when she was invited to participate in the exhibition in 1998 – she was given complete freedom of expression, and painted the cornerof the gallery with green paint. This gesture shoutedout – and brought her fame, convincing her that her risk had paid off. Expanding her boundaries, Katharina sprayed even her own bedroom. In the exhibition catalog you will also find a house on the beach, painted in coral color, and a number of other equally noteworthy works (also here: www.katharinagrosse.com). Katharina Grosse’s work has been featured in international solo and group exhibitions, as well as major art projects and biennials.